Whoot! It’s that time again. Time for the 3rd YAmazing Race with MGnificent prizes! In case you weren’t here for the first or second race, it’s a blog hop featuring over 50 debut authors, and prize packs that include ARCs, gift certificates, swag, and more! If you haven’t yet been to the Apocalypsies website, please click here to start from the beginning and read the complete rules. Welcome to my stop! Now on to the race! Great! You’ll need remember it for the quiz ahead! And don’t forget, you must complete ALL FIVE quizzes to be eligible for a prize pack. But, wait! I have another giveaway for you! Want a 2nd chance to win a pre-order of my book? Click HERE to go to the next stop on the race! I’m so excited to announce that my street team, The Elysium Underground, is live and looking for recruits! What exactly is a street team and what do I have to do? A street team is basically just another way for me to get word out about my book. Similar to Gretchen McNeil’s Army of Ten (don’t worry, I checked with her first. 🙂 ) I’m offering prizes for spreading the word about my book. I’m using a rankings system, but instead of me giving you a task to do, I’m offering a “bounty” for each task you do. The “bounty” is just a certain number of points. And each rank is obtained by earning a certain number of points. A lot actually. Each ranking earns different swag including buttons, bookmarks, magnets, etc and a certain number of entries to be earned toward a HUGE monthly prize. On top of that, the top two ranks earn a chance to have a character named after you and/or a chance to be named in my acknowledgement section. Speak up: Comments Off on Elysium Underground Is LIVE! First blog tour starts today! RENEGADE is officially in the final run to its US release! There’s less than a month left. So, I’m so excited to say that my first blog tour sponsored by The Book Paparrazzi starts today with a kick off post by Evelyn’s best friend, Macie, over at Read-a-holicz blog. 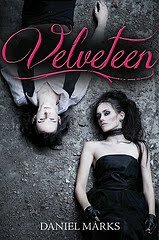 This blog tour will run from today October 16th-November 9th. Following that will be another blog tour sponsored by the ever awesome Mundie Moms! See below for a list of all the happenings for blog tour 1 and where to go to catch all the awesomeness. 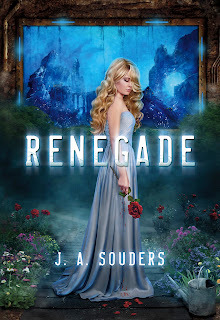 And don’t forget to check them all out for a chance to win a copy of RENEGADE. P.S. If you entered my contest to win an ARC, check that post to see if you won. If you did email me at j.souders (@) jasouders(dot) com with your name and address. Happy book birthday to the following awesome authors and their spectacular books! Speak up: Comments Off on Happy Book Birthday! The awesomeness that is awesome! They say that a picture is worth a thousand words, so I’ll let the picture speak for itself (you can click on all the pics to make them bigger)! 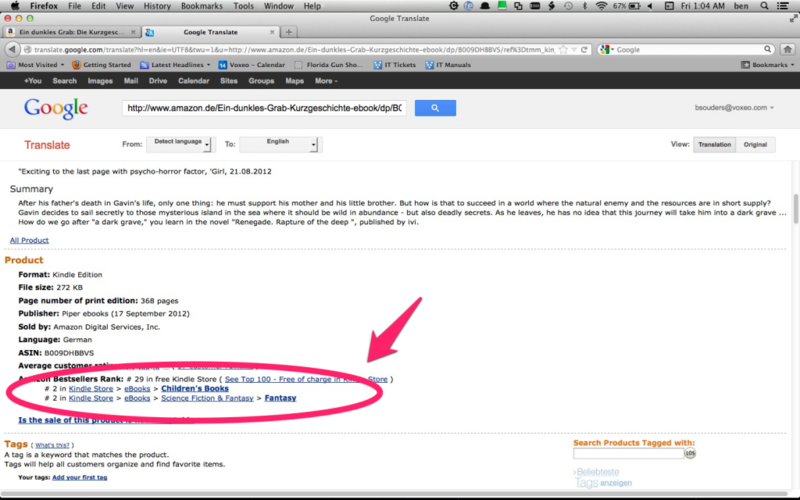 Why, yes, that IS the kindle version of German RENEGADE: TIEFENRAUSCH at #83 in the children and teen book section and #1, 369 of ALL the books in the kindle store! Thank you for asking! 😛 And look! In case you’re wondering, the hardcover has had some awesomeness happening, too, (it’s numbers haven’t been to far from this either) but I HAD to share this. 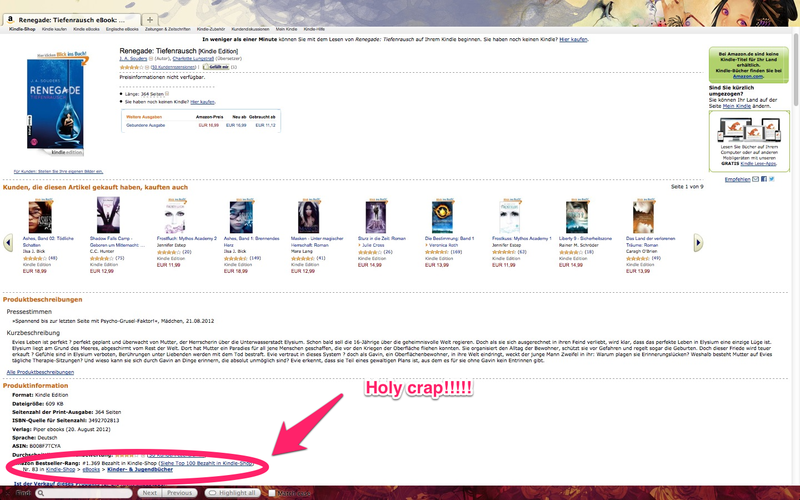 The kindle version was #83!!!! I just…I just…I can’t express how this makes me feel. As my CP tells me, this is epic and I’m astounded. 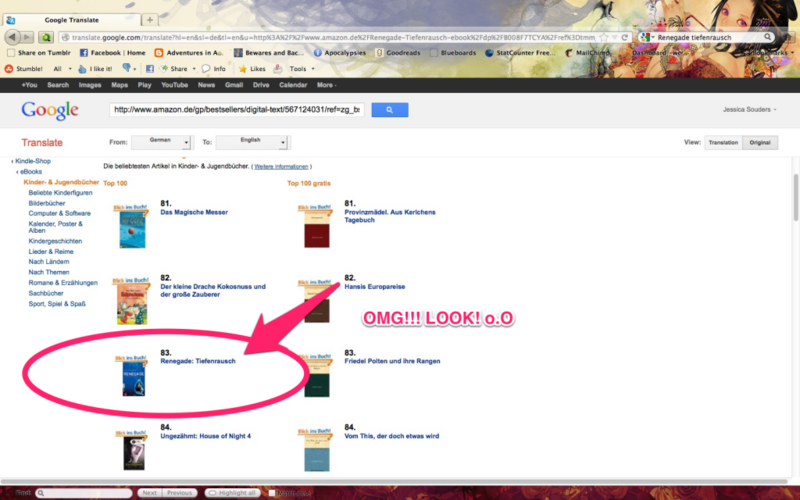 I couldn’t be happier, but I’m also repeatedly pinching myself to make sure I’m not dreaming! I just want to send a HUGE thank you to the awesome people at IVI Piper for absolutely everything you’ve been doing for Renegade. And, of course, to everyone who’s bought and reviewed and spread the word about it. You all, I’m seriously in tears right now typing this and I can’t thank you enough for any of it. Thank you SO so so much. Speak up: Comments Off on The awesomeness that is awesome!